Tattoo Blog » Meet Bugs! Tattoo Blog » Inspired » Meet Bugs! Perhaps the most important aspect of being a lover of art – whether that art is music or fashion or painting or tattoo – is the ability to recognise a new and different approach and to appreciate it for what it is. In other words, the ability to move forward in taste and appreciation is essential to having a broad and on going appreciation for art. It’s fine to like one particular style or one particular genre of any given art form, but sticking only to that style or genre limits the extent to which new art can grow and flourish. In other words, don’t just eat potatoes if there’s a whole table full of food, sample it all. Tattoo artist Bugs (aka Pascal Jarrion) is exactly what I’m talking about when it comes to experiencing something new. Mixing styles of painting with tattoo isn’t any easy thing to do, but Bugs is not afraid to try. 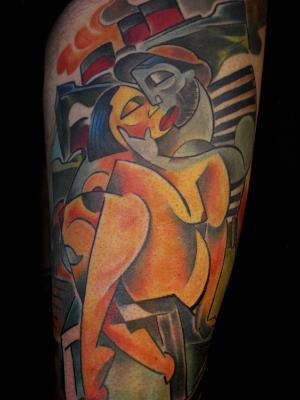 And that’s a great thing because the end result of his mix of cubism, art deco and classical art creates tattoos unlike anything else out there right now. That may or may not be your thing, but the point is that Bugs is an original in his field of tattoo and it makes looking at his work all the more interesting once you get into his style. Hailing from Perpignan, France, Bugs attended fine art school, then made his way to London, England where he decided to open a small tattoo studio. According to Bugs, in London “there were chances for a career which were not available in France at the time.” Bugs stayed in London, operating his studio for six years. In 2005 he moved to Los Angeles and currently calls LA his home. In addition to his tattoo work, he also paints and sculpts, with exhibitions literally all around the world and back. Check out more of Bugs’ stuff here, as well as a video interview here.